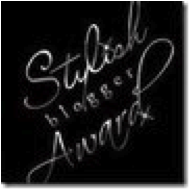 I was reading one of my favorite blogs last week, and saw she received the Stylish Blogger Award. Good for her. She deserves it! Then, I kept reading and saw my name in her list of blogs she enjoys and wants to share! My jaw dropped. Then, on top of that, she sent the award to me! For those of you who know me, this might be a bit of a surprise. Style isn’t my forte, but, thankfully, Jen is a nice lady who likes to pay it forward. As a recipient of the award, there are three steps to follow. I found Jen Rognerud by stalking her articles on skirt.com. She’s a great writer – always amusing, a doula (something I’d never heard of,) and has a serious Target addiction that she’s trying to cure by going a http://yearwithout.net/. What an honor to be listed on her blog. Step 2: Share 7 Things About Yourself. 1. In January 2010, I had a piece of gortex implanted against my right vocal cord, which is paralyzed after surgery I had has a baby. It makes it possible for me to yell at people. 2. After a terrible dye job here in Vietnam, I shaved my head and have kept it that way for that last four months. My clean-cut, J. Crew, pilot husband encouraged me to do it by saying that I had a perfectly round head. It’s soft and velvety, and all of our friends seem to think rubbing it brings them luck. 3. I am the third of six children. I’m glad our parents were crazy enough to have so many. It’s wonderful. 4. Last summer, my husband and I planned the party where we would get married in less than two months (a month before we moved out of the country.) I have attended over forty-five weddings – either as a guest, family member, or bridesmaid (eight times.) I have played the violin in more weddings than I can remember. And, not to be mean or anything, mine was the best. 5. Living in Vietnam is teaching me to be assertive. I have met wonderful people here, but there are always those who want to charge more because you are foreign, or expect you to pay for something you didn’t ask for. Taxi drivers know I live here, and, still, after seven months, take me the long way around sometimes. Because saving face is a big deal here, people expect to be able to not fulfill the end of the deal and you just quietly accept it. I’m over that. Don’t make me yell at you, cause I can!! 6. I hope no one ever asks me to choose between wine, garlic, and my husband. 7. I was published this month for the first time ever in AsiaLife HCMC magazine! Step 3: Pay it forward! I read so many great blogs every day. It’s wonderful to have a chance to share some of them with you. Christine Berardi’s http://cognitiveleeks.wordpress.com/ My sister’s blog is the next best thing to her food while I’m so far away. It’s not all about food, but when she gives recipes, they’re written so a novice can follow them. She’s a southerner who spent 10 years near San Francisco enjoying all the great food CA has to offere, and is now miserably living in New Jersey. Oh yeah, she is cooking/blogging her way through Garden & Gun’s Southern food bracket. Kristen Lamb’s http://warriorwriters.wordpress.com/ Kristen is a social media guru, author of “We Are Not Alone: Writer’s guide to social media” and has been teaching me how to build my author brand. She has great information about twitter, blogging, and facebook, and how to use all these things to build your platform and community with others. Amy Vansant’s http://www.kidfreeliving.com/ Amy Vansant is another writer I found through skirt.com. (I love personal essays.) She writes a snarky and ridiculously funny blog that will, at times, make you spew your wine all over your keyboard. And, you guessed it, she doesn’t have kids. Tanya Robert’s http://joyisfoundinthejourney.blogspot.com/ Tanya is a childhood friend who I managed to drag to Vietnam with me. She writes about their adventures – travel and day to day – and I particularly enjoy reading a different perspective on life here in Saigon. Danielle Meitiv’s http://daniellemeitiv.com/ Danielle is one of my classmates in Kristen Lamb’s author branding class. She is an oceanographer and writer. Her blog is educational and an interesting change of pace from my usual travel and writing blog diet. I hope you enjoy these blogs. Thanks again to Jen for sending the award my way. Any blogs out there that I should know about? I’m always looking for more to read. Send them my way. Thank you for the mention of my blog – you are so very sweet 🙂 Congrats on your award and I very much enjoy reading your blogs and I am excited about your future in journalism. Keep it up! You’re always an encourager, Tanya. Thank you 🙂 Now I need to go read your latest. Thanks so much for the shout out! I’ve enjoyed your comments on my blog, but didn’t realize you had one too! (I’m a little slow sometimes.) Looking forward to reading about Vietnam!